Diabetics are saddled with the unenviable task of checking their blood sugar levels constantly. But a new non-invasive technology lets diabetics keep tabs on their glucose levels with contact lenses that change colors as their blood sugar rises and falls. Nanoparticles — is there anything they can't do? 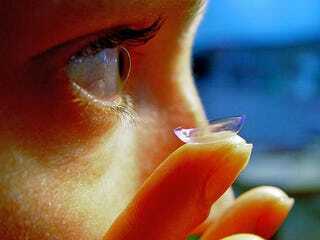 — embedded in the hydrogel lenses react with glucose molecules in naturally occurring tears. A chemical reaction then causes the lenses to shift their hues, alerting the wearer to falling or spiking blood sugar levels. The wearer can then make the appropriate adjustments to his or her blood sugar, all without having to carry around (and use) devices for drawing and analyzing blood.